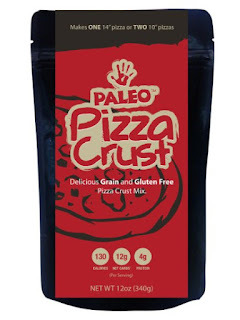 The last time I was back home at my parents' house, rummaging through their pantry, my mom was kind enough to share a package of "Paleo Pizza Crust" that she ordered from Julian Bakery. I thought this would be a fun product to put to the test, and review for you guys! It's not the cheapest product, but the ingredients seemed promising, so I decided to give it a shot the next time Dathan & I were having a pizza craving. 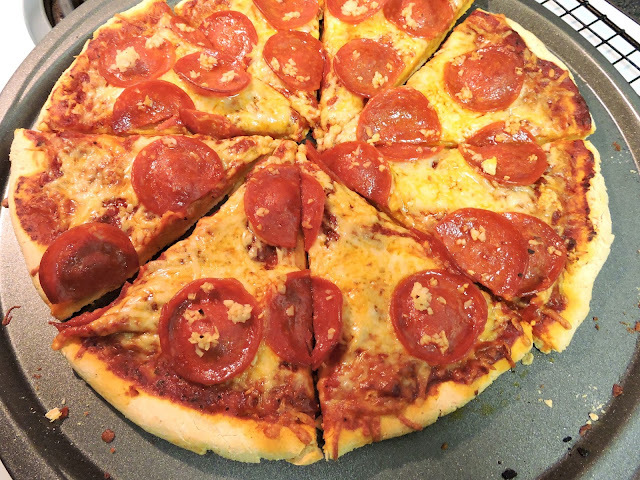 Dathan picked up some 365 Organic Pizza Sauce (amazing), Applegate Naturals Uncured Pork Pepperoni, and 365 Organic Shredded Italian Blend Cheese for our toppings-- and we added some fresh chopped garlic on top! 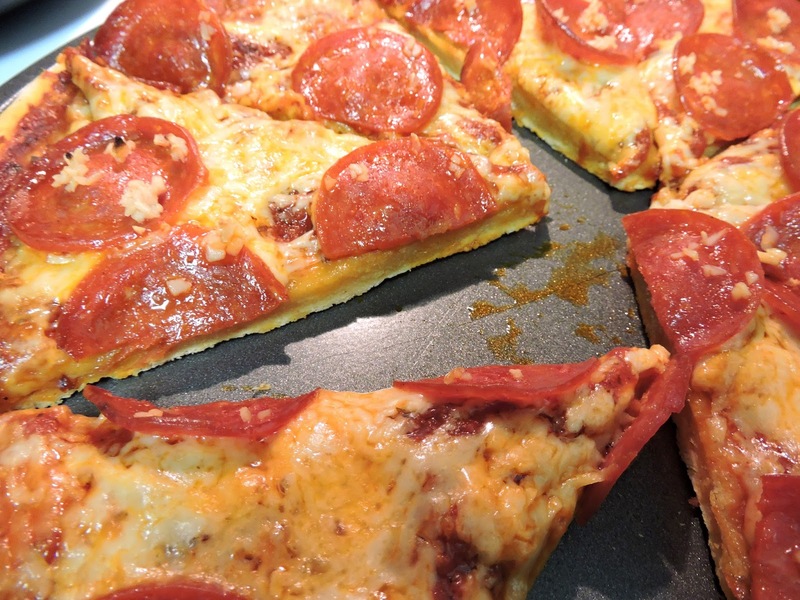 Taste: Light, mild flavor; similar to a typical pizza crust. Thumbs up! Texture: Slightly dense; similar to a flatbread pizza or naan bread. It stayed firm when you picked up a slice, and didn't crack or get soggy at all. The outside edge of the crust was really crispy. Overall Thoughts: The instructions mentioned using a pizza stone for a more crispy crust-- but I feel like that would make it too hard. I liked how it turned out using our non-stick pizza pan. A cookie sheet would do a similar job! When mixing up the dough, we added an extra tablespoon of water in order to get it all to mix. It was easy to spread out with a rolling pin or hands. The packaging states that this will make two 10-inch pizzas or one 14-inch pizza. 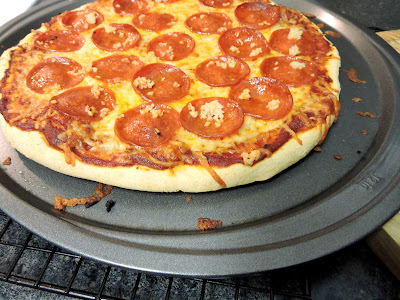 We used all of the dough to make one pizza in our 12-inch pan. I can't imagine making two 10-inch pizzas from this. Overall, we were really impressed and can't wait to try it out with different toppings! 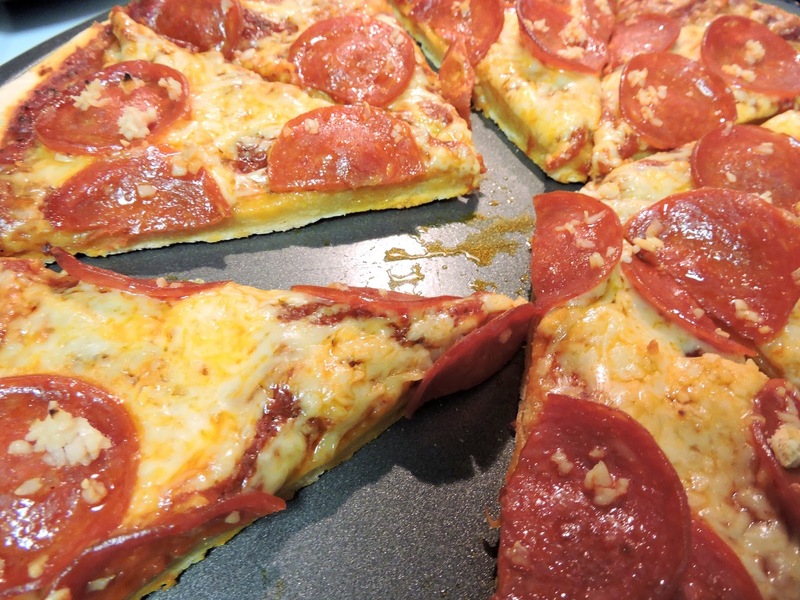 We only used half the jar of pizza sauce, and less than half each of the cheese & pepperoni. If you bought two packages of crust, you could easily make two full-size pizzas with those ingredients-- which is a pretty good deal when it comes to Paleo-friendly or gluten free pizza. Obviously, if you are strictly Paleo & avoiding dairy, you can omit the cheese completely-- or try out a dairy-free version.